Celebrate Bill & Ted Day With a Most Excellent Collection From Shout Factory!!! 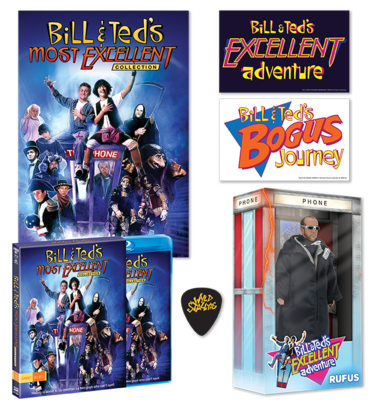 In celebration of Bill & Ted Day, Shout Factory has put together a MOST EXCELLENT COLLECTION! Not only do you get to rock and roll with the Wyld Stallyns through history, there are all kinds of extra goodies in this pack to make anyone discover their inner-dude. Rock with Keanu Reeves and Alex Winter as the excellent Ted and Bill. The collection will release September 20, 2016. The collection begins with the blu-ray release of ‘Bill & Ted’s Excellent Adventure‘ In the small town of San Dimas, a few miles away from Los Angeles, there are two nearly brain dead teenage boys going by the names of Bill S, Preston ESQ. and Ted Theodore Logan, they have a dream together of starting their own rock and roll band called the “Wyld Stallyns”. Unfortunately, they are still in high school and on the verge of failing out of their school as well, and if they do not pass their upcoming history report, they will be separated as a result of Ted’s father sending him to military school. But, what Bill and Ted do not know is that they must stay together to save the future. So, a man from the future named Rufus came to help them pass their report. So, both Bill and Ted decided to gather up historical figures which they need for their report. They are hoping that this will help them pass their report so they can stay together. CLICK HERE TO PRE-ORDER FOR $79.99!! The sequel on blu-ray is just as crazy, in ‘Bill & Ted’s Bogus Journey‘, the world of our distant future is a veritable utopia, thanks to the lyrics of two simple-minded 20th Century rock and rollers, Bill S. Preston, Esq. and Ted “Theodore” Logan. However, a would-be conquerer threatens to throw history off-track by sending “most non-non-heinous” evil robot Bill and Teds back to kill their good counterparts. Finding themselves dead, the boys must outwit the Grim Reaper and traverse Heaven and Hell to return to the land of the living, rescue their “babes” and have a “most triumphant” concert at the all-important Battle of the Bands. This entry was posted on Thursday, June 9th, 2016 at 3:31 pm	and is filed under Film, News. You can follow any responses to this entry through the RSS 2.0 feed. You can skip to the end and leave a response. Pinging is currently not allowed. « Netflix’s Supernatural Series ‘Stranger Things’ Delivers An Intriguing Trailer!! !